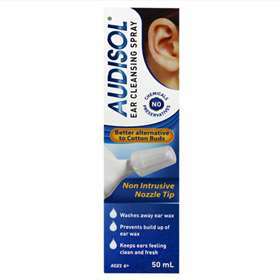 Audisol Ear Cleaning Spray washes away excess ear wax and prevents wax build up that could otherwise block the ear way causing hearing loss, ear pain or a tickling cough. Audisol use a natural, non-medical formula which makes it safe and suitable for children as young as 6 years old. Better alternative to cotton buds that can push the wax further in the ear way. Prevents the build up of wax. Keeps the ear feeling fresh and clear. Helps relieve symptoms of excess wax build up. Suitable for adults and children aged 6 years+. Natural, non-medicated formula with no chemicals or preservatives. Secure transparent end-piece over the nozzle before use. Fit the nozzle inside the ear as far as it allows. Squirt once in one or both ears. Repeat this 2-3 times a week for casual use. If using hearing aids, earplugs or experiencing ear wax symptoms repeat 1-2 times a day as needed. Tip the head to the side and wipe away any excess liquid in the outer ear. Clean the transparent end-piece with warm soapy water and then leave to dry. If symptoms persist consult a health care professional. Please ensure you read the enclosed leaflet carefully before using this product. Pressurised container that may burst if heated, pierced or burned even after use. Do not expose to temperatures exceeding 50°C, hot surfaces, sparks, open flames or other ignition source. Pressurised container, may burst if heated, pierced or burned even after use. Do not use on children under the age of 6 years old. Using one Audisol can between two or more people may spread infections so ensure to clean the end-piece well. Consult a medical professional before use if you suffer from frequent dizziness, giddiness, tinnitus, balance disorders, or are diabetic or Immuno-suppressed. Are allergic or hypersensitive to any of the ingredients. Have a history of perforation of the ear drum. Have pain in your ears or your ears are inflamed or infected. Have any foreign bodies in your ear canal. Are using other ear drops. Are being treated with a tympanic drain (Grommets) or pressure equalising tubes (PETs) in the ears. Natural sweetener (diluted to Isotonic physiololgical level (0.9%) with purified water).